Celluloid is pretty much the first thermoplastic,(created in 1862). Because celluloid is easily molded and shaped, and it was first widely used as an ivory replacement. 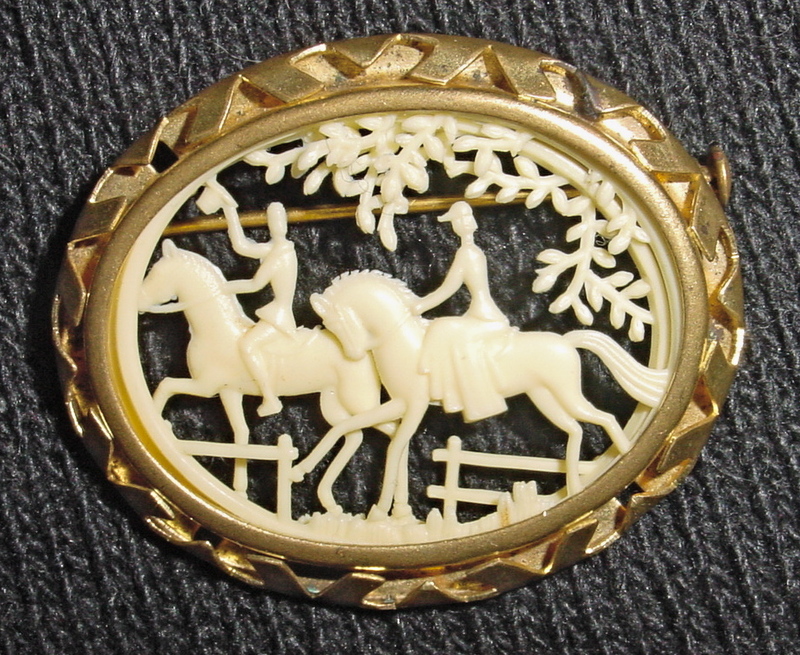 This particular style of faux ivory, faux carved bijoux were quite popular in the 1920s and 1930s because they were cheaply made. They are also sort of collectible because celluloid is such an unstable substance. It’s highly flammable and it decomposes so finding a piece in good repair is hardish. Although celluloid can be quite beautiful in its decaying state. Check out the Rosamund Purcell’s photos in Ricky Jay’s book Dice Deception Fate And Rotten Luck. Or watch the film Decasia. I actually have one of these (the frame is a bit different however)! Was just looking for it online when I ran across your post. Nice to know! Thanks.